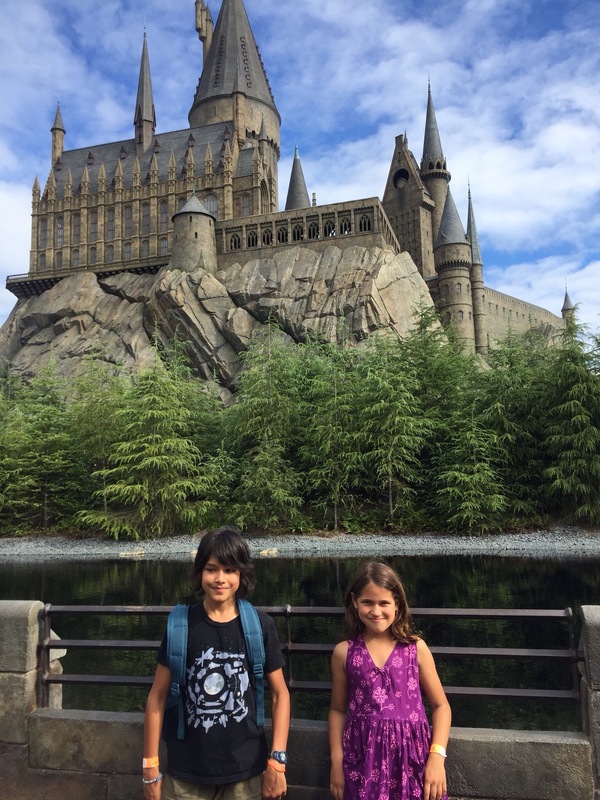 It was time for the Wizarding World of Harry Potter! I had read blogs on how to navigate the crowded park and long lines, had gotten tickets ahead of time and a pass that let us into the park earlier than others. I didn’t want to spend the extra $60 per person to get the express passes to get on rides faster, but did opt for the extra wristband for early admittance. 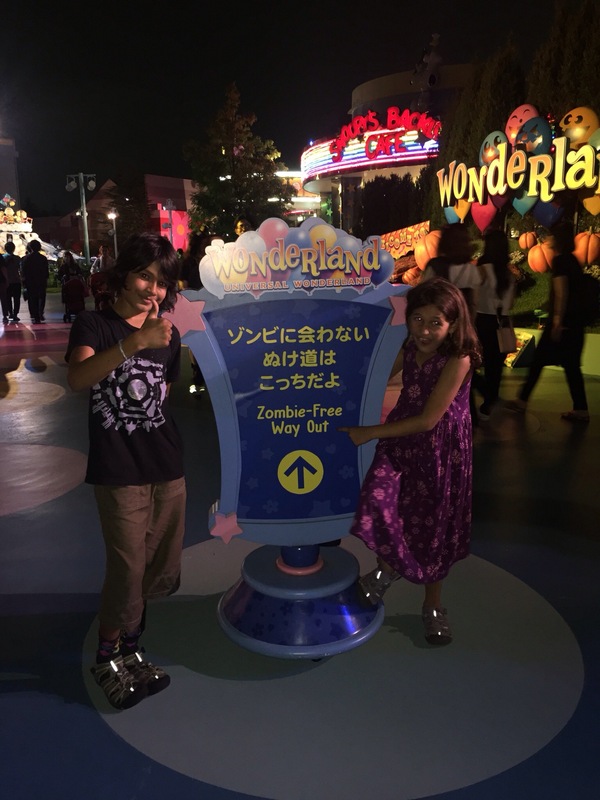 Again, Eric opted not to come with us to Universal Studios Japan (USJ) because he didn’t want to learn about how theme park culture varies within a country. Such a xenophobe that one. This time, I said, I would try to fit in more. I put on a nicer outfit, blew out my hair, and wore makeup, though I drew the line at wearing high heels like many Japanese and opted for sneakers. We ambled easily to the train station as I’d made sure we left early, where I realized I had forgotten the wristbands back at the house! I ran back to the house in five minutes, leaving the kids on the train platform (totally fine, as Japan is incredibly safe and you see kids younger than mine out alone all the time), and thankfully Eric was still home and I was able to find the bands and ran back to the train station. I then realized I didn’t have my phone with me, having left it at the house when I went to get the headbands! Crap! Well, I figured, we wouldn’t take pictures but that would be okay. We got on the train and transferred at the next stop. At that second, I realized that our tickets were electronic ones and I could ONLY ACCESS THEM ON MY PHONE. I may have used some colorful language out loud here, in front of the kids. It was entirely warranted. Clearly, I had not imbibed my felix felices this morning. We all tried to use accio to bring the phone to us, alas, we were wandless and thus powerless as well. We quickly got off the train we were on, ran to the other platform, got on the train back to our station, where I again left the kids and ran back to the Air BnB, yelling over my shoulder for them to switch platforms. Of note, I had now seen the same station master three times previously on my other station entrance and exits. He saw me enter with the kids, then run out on my own, then run back in, and now running out alone yet again, and becoming more disheveled with every passing. I’m sure I only verified whatever stereotypes he has of foreigners and created some new ones. 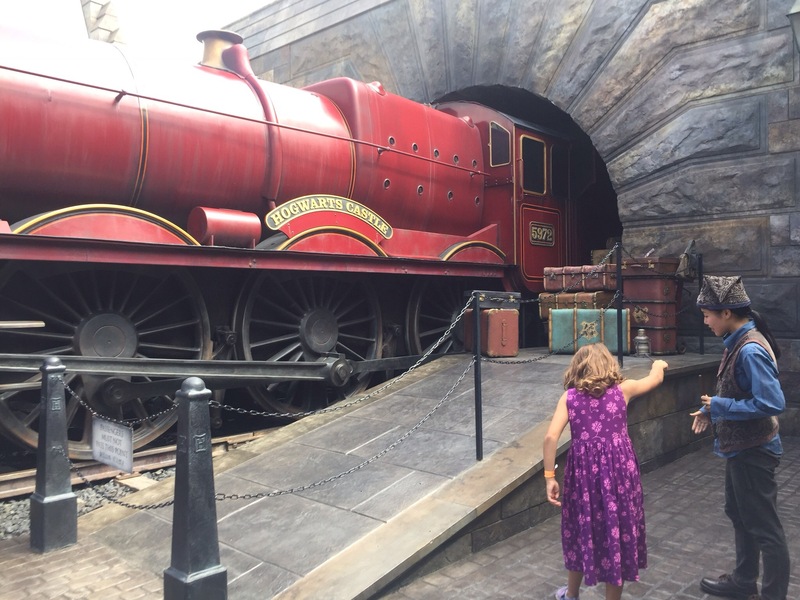 The boy took off like the proverbial bat out of hell and didn’t stop until he got to the Forbidden Journey ride, one of the most popular in the park. Given that I’d already basically sprinted a couple miles that morning, I wheezed after him and tried to keep up, not wanting to leave the girl behind either. I feebly yelled out after him to wait a few times, to no avail. He was a boy on a mission. Because of his determination, and because of the poor footwear choices of many Japanese parkgoers, we were able to walk on to the ride. When we walked out five minutes later, the wait time was two hours. After that we headed out and could really enjoy Hogsmeade village. 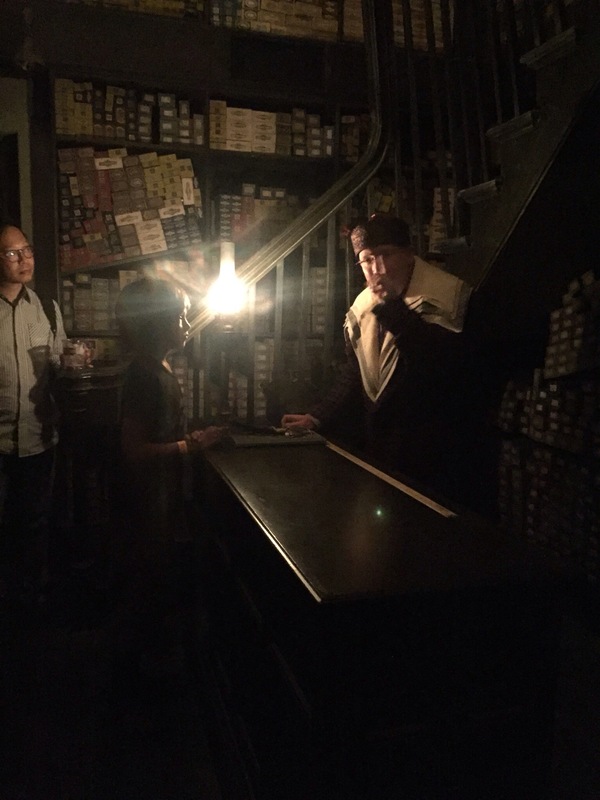 The boy was chosen for the wand show at Ollivander’s! The wand that chose him (which you can then buy) was unfortunately one with a hideous skull on the handle, so he didn’t want to keep it. 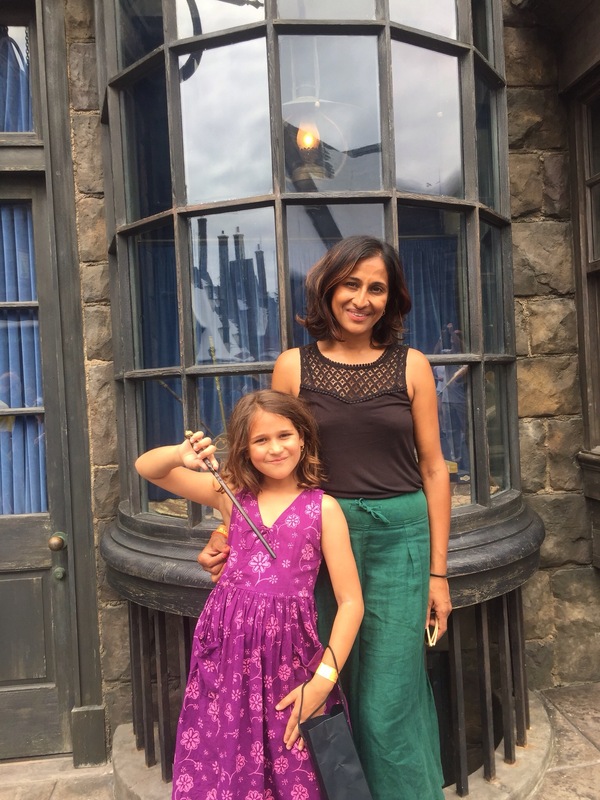 The girl picked out a different wand for herself, and then we went about to do all the magical things in the park you can do with your wand! 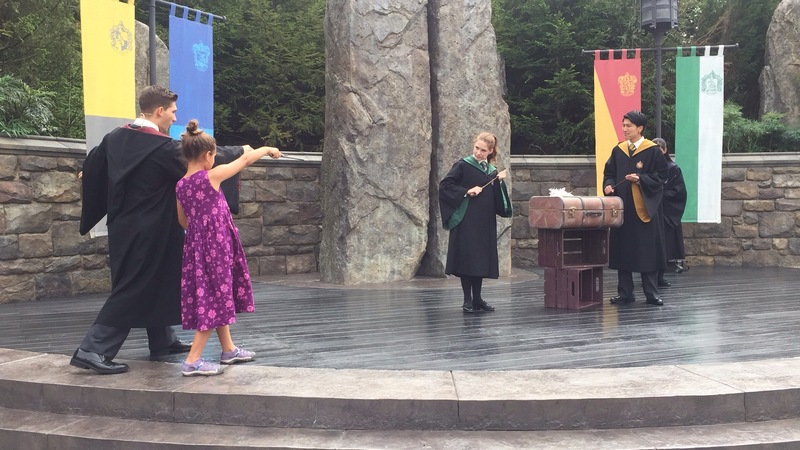 The girl was chosen for the “Wand Studies” show and got to show off her skills. These two shows were in dual English and Japanese, so we could really enjoy them. The rides were all in Japanese alone, which of course it’s Japan, but I was still surprised because there are so many foreign visitors to the park — Korean, Singaporean, Chinese – that I’d think there’d be more dual language. Still it was pretty fun to see Dumbledore’s picture chattering away at us in Japanese. 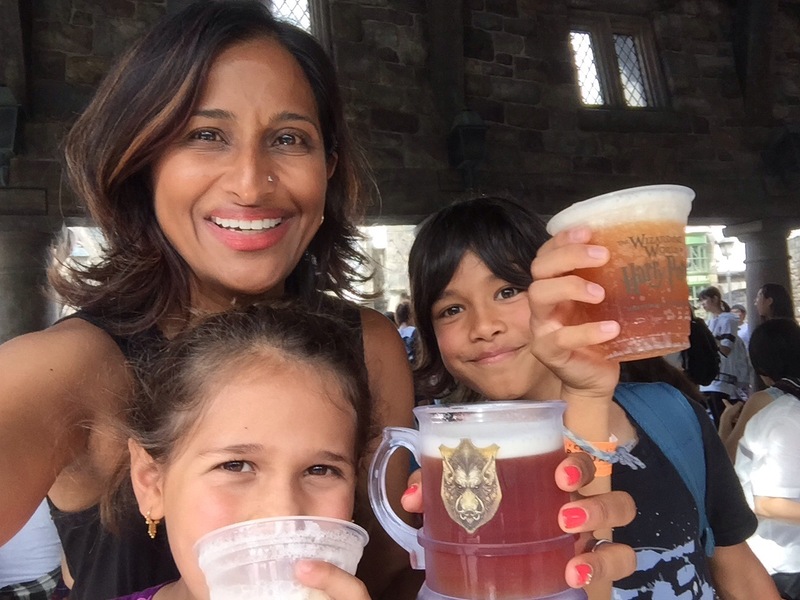 After getting our fill of Hogsmeade, where we stayed for a full three hours, we walked out and got a timed ticket to return in the evening to see the Death Eater attacks, special for Halloween, and the castle at night. 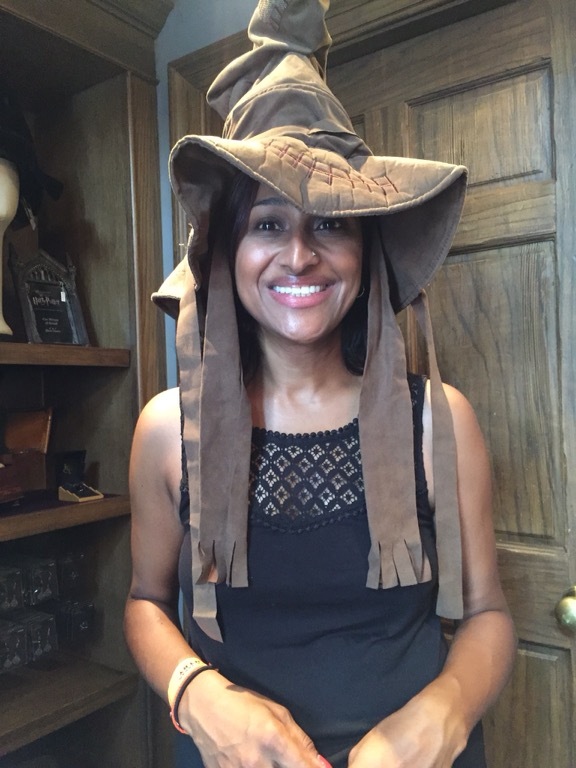 It sorted me into Ravenclaw! In front of Dervish and Bangs! See how I made an effort? The rest of the park just pales in comparison, and while we enjoyed ourselves it is a true letdown after HP. Unlike Disney where each area is done up to the last detail, it was only this way in HP and the rest looked straight out of an 80’s theme park, literally. Universal Studios Florida, apparently, has relatively new rides and attractions, but here, it’s as if time just stopped. There’s still the town of Amity and the Jaws ride, which is exactly the same as it was forever, except the boat captain screams in Japanese hysterics and the Japanese riders, rather adorably, are scared (or pretend to be so) and scream at the large animatronic shark. There’s still the Backdraft show, a Terminator ride, and….a Waterworld show. I mean, really? The kids area is based on Peanuts, Hello Kitty and Sesame Street characters. I did get the kids to go on their first real roller coaster, with a 50 degree drop and going up to almost 60mph. We used the single rider line instead of wait three hours, meaning that my son was left to his own devices for his first ride of terror, because I’m a caring mom like that. The girl was at least in the same car as me. We went to one area which seemed like a museum of all the Hello Kitty bows. 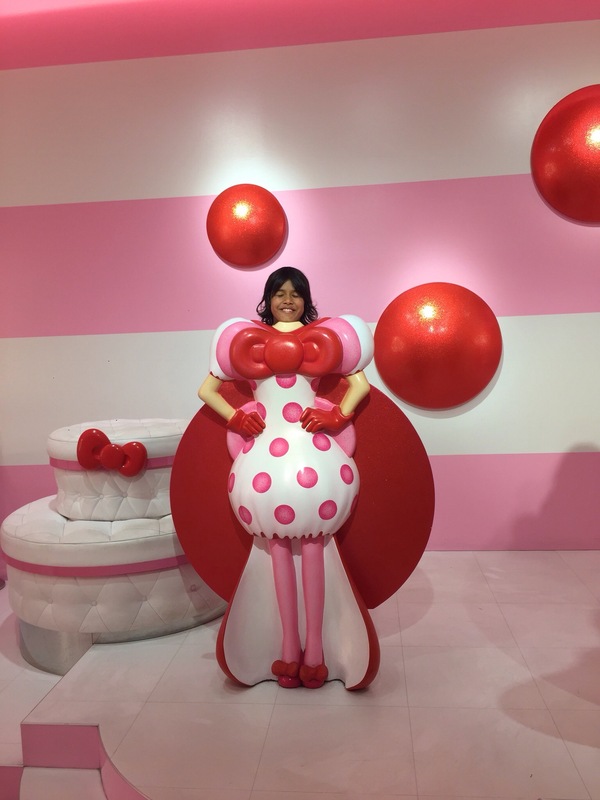 Strange enough, but then at the end there was a Japanese woman who said in a high pitched voice “Hello Kitty is so happy to meet you! 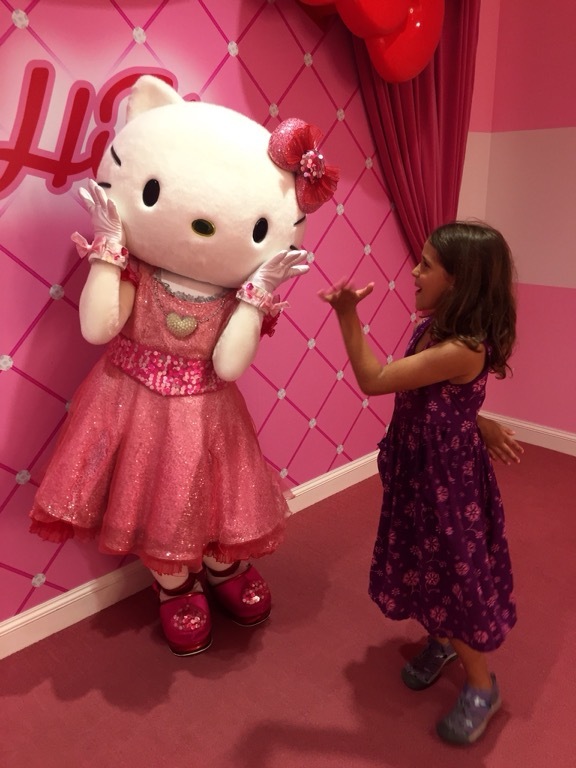 You are a friend to Hello Kitty! Now let’s practice! When I say ‘hello’ you say ‘Kitty’ Okay?! Helloo…” We all looked at each other, wondering if this was the password to escape cupcake hell, not really knowing what it has to do with being a friend to Hello Kitty. I mean, I don’t do this with my other friends. “Kitty!” We all cheered back. “Now let’s do it again!” Uh, sure. I guess we did it right because we then were led into a room to meet Hello Kitty, and have our picture taken, which of course we could then purchase if we wanted to. 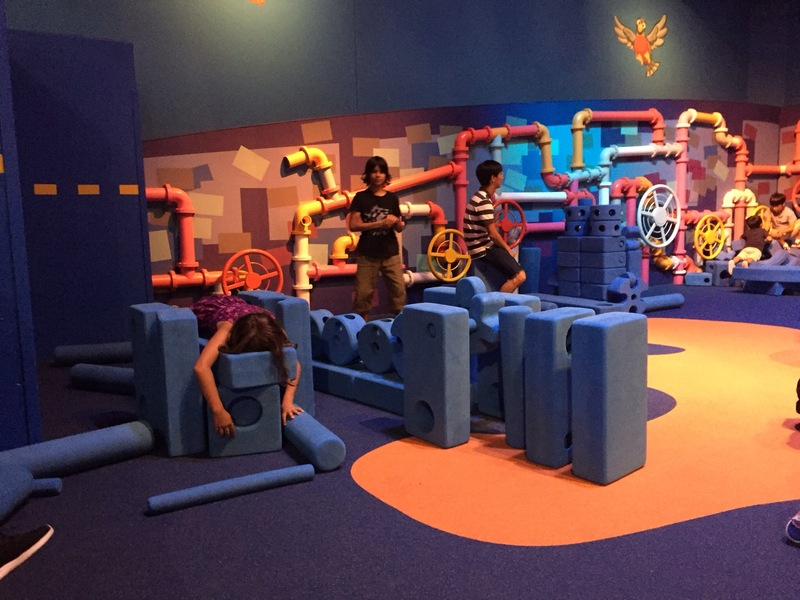 An indoor play area where the girl made…a massage table for herself. Likes the finer things in life, that one does. Because it’s Halloween time here, the park has zombies that come out at night and horror themed rides around the periphery, which don’t have much signage because they don’t want to scare the little kids, but the one truck with bloody handprints on it was enough for my tender hearted boy, who decided he really didn’t want to see the zombies. We saw one while we were getting back to HP land at night, and while I found it funny to watch them scaring people, the kids were utterly terrified and almost couldn’t eat their dinner! 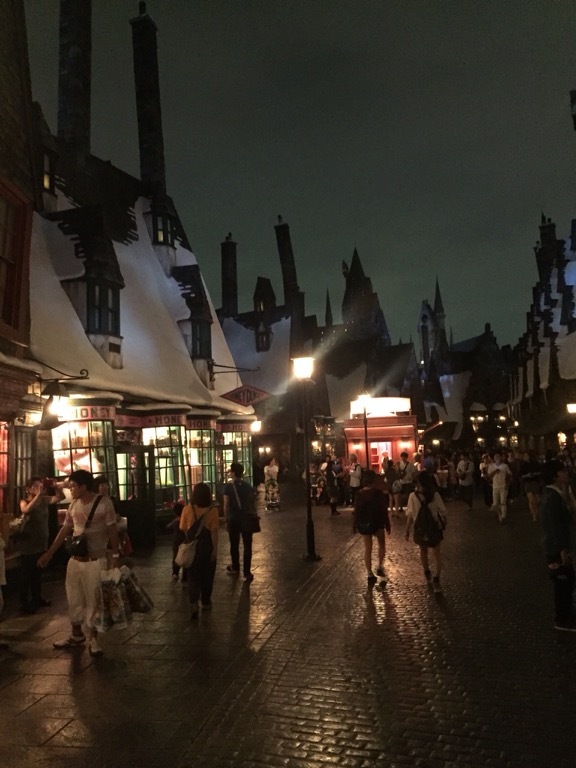 At night, HP land is magical, with the windows all lit up and it feels special. You walk through the Forbidden Forest to get there, and hear the trees talking to you and animal sounds as you walk along. We were able to enjoy the entry more as we weren’t racing to the ride. The Forbidden Journey only had a ten minute wait again! We hopped back on, of course! We made it out of the park safely and happy again with the memory of HP as our last one of the park. Overall, I’d give the Harry Potter area a 10, though I wish it was bigger. The rest gets a solid 6 except for the coasters which were fun. 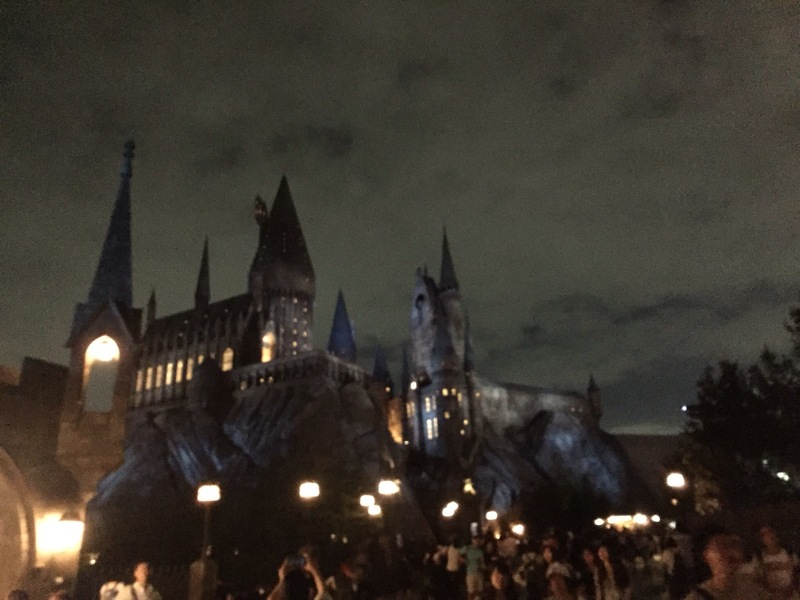 I’m glad we went, since I don’t know when we’ll be able to get to another HP land in the near future, and we’re all so into HP right now that it was just right, though if that’s not your draw, then I don’t know that I’d recommend it. Unless you’re SUPER into Backdraft and Waterworld. And speak Japanese to understand those shows. Then run, don’t walk there.